Two gold, one silver and one bronze made Wednesday an unforgettable day at the Paralympic Games. 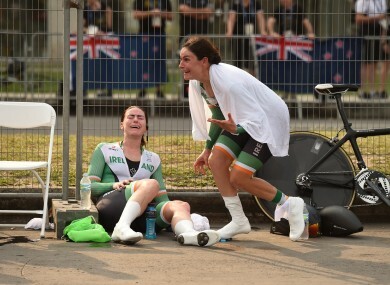 Eve McCrystal and Katie-George Dunlevy react to winning gold. PONTAL IS A small neighbourhood in the west zone of Rio de Janeiro, known for nothing more than its blissful coastline. Now, it will forever be the scene of one of the great days in the context of Irish Paralympic, and sporting, history. In the space of five glorious minutes, this turned into the most golden of afternoons. As Eoghan Clifford reflected on his stunning gold, the screeches of delight from Katie-George Dunlevy and Eve McCrystal could be heard 200 yards down the course. It was delightful chaos. Earlier, Colin Lynch had set the tone for what was to come, storming to silver and putting to bed the heartbreak and anguish he suffered four years ago having missed out by the tiniest of margins. Then came the moment Ellen Keane has been waiting for so long to arrive. A Paralympic medal in the pool and a first for Ireland’s swimmers at these Games. The jubilant reaction of her family in the stands and her beaming smile capped off what was a truly memorable day; the icing on the cake. Day seven always had the potential to be one of the standout of the Games from an Irish standpoint, but even still predicting a result of two golds, one silver and a bronze would have seemed reckless. Then again, that wasn’t allowing for the inspired performances of four cyclists breaking every pain barrier in their quest for Paralympic glory and the coming of age of a swimmer who has displayed potential for some time. If Keane is to be accredited with the final act, then Colin Lynch deserves every bit of praise for setting the tone for what was to come. Setting off shortly after 8am local time, the 45-year-old powered his way around the 20km course and was in control from the moment he rolled down the starting ramp. Reaching the halfway juncture in second place, he never looked like finishing outside the podium places with an accomplished performance in the most stifling of conditions. “I put all the pressure on myself but I had a huge amount of confidence knowing I had done all the work and every last thing possible I could to perform today,” he said, with the silver medal around his neck. Coming to Rio and medalling was redemption for Lynch, who endured anguish in London where he was denied bronze by just one tenth of a second. Today, he was on the right side of those margins. “Winning the World Championship is something that stays with me forever and it is very special,” Lynch, who lives in Manchester, said. For Clifford, he ranks Paralympic gold as his greatest achievement, not least after the week he’s had. A three-time world champion, the Limerick native has been plagued by a knee injury which stems from a degenerative muscle disease. Winning bronze on the track last week took its toll and despite being in considerable pain in the last few days, and even contemplating not riding, the NUIG lecturer somehow got himself in the mental and physical condition to compete — and obliterate the rest of the field. His imperious time of 38:21.79 was a full 68 seconds quicker than second as Clifford’s dominance at this level was underlined with an emphatic performance. As Clifford made his way through the mixed zone, Dunlevy and McCrystal had just discovered they had become Paralympic champions. The Time Trial format lends itself to drama, with the girls forced to wait for their fate to be delivered in the cool-off area not far from the finish. Their reaction to the news told its own story, four years of hard work and sacrifice manifesting itself into one crowning moment. Slumped at the side of the road, exhausted from the exertion of riding in temperatures peaking at 35 degrees celsius, they waited anxiously. As the fantastic four posed for photographs with their medals at the Time Trial finish line, one Australian rider walked past to offer her congratulations: “Great job today, Ireland,” she said. Eight hours earlier, few could have envisaged such success but here we were on a wooden podium waiting for the riders to go live on RTÉ with medals hanging around their neck. One after the other, they got quicker and quicker, taking the stage by storm and giving Ireland’s Games the spark it needed following the lull after Smyth and McKillop struck gold. And if three wasn’t enough, Keane gave us four with the type of performance which suggests she has matured as a swimmer. A first Paralympic medal for the 21-year-old and a first reward for Ireland’s swimmers in the pool at this Games. “I finished, looked up, saw the three beside my name and was just freaking out,” the Clontarf native said. With her family lending their support at the Olympic Aquatics Stadium, Keane grasped her opportunity and rounded off the most remarkable of days for the Irish in Rio. Wonderful Wednesday? Lets go for Terrific Thursday. Email “A day to remember as Ireland shine in the Rio sun to deliver four glorious medals ”. Feedback on “A day to remember as Ireland shine in the Rio sun to deliver four glorious medals ”.